Haven't checked out part 1 and part 2 yet? Make sure you do! Happy Anniversary!! We went to town to look for an olive oil tasting, but absolutely nothing opened up till 10. We did go see the amazing Castlello di Amorosa and take pictures. We drove around and ended being the first group at Sterling. What a place! It is more of an experience than a tasting, and what a production. The tour starts with a Gondola ride up to the building on top overlooking all of the vineyards. It’s sort of a Disney effect. We got the extra tastings free with our hotel card and visited the art gallery with my favorite Chagall “Fox with Grapes”. It also included several original Ansell Adams, a Picasso and a Renoir among others. I can’t find our tasting list – but won’t give up! After Sterling, we went to Tra Vigne for a pizza lunch. 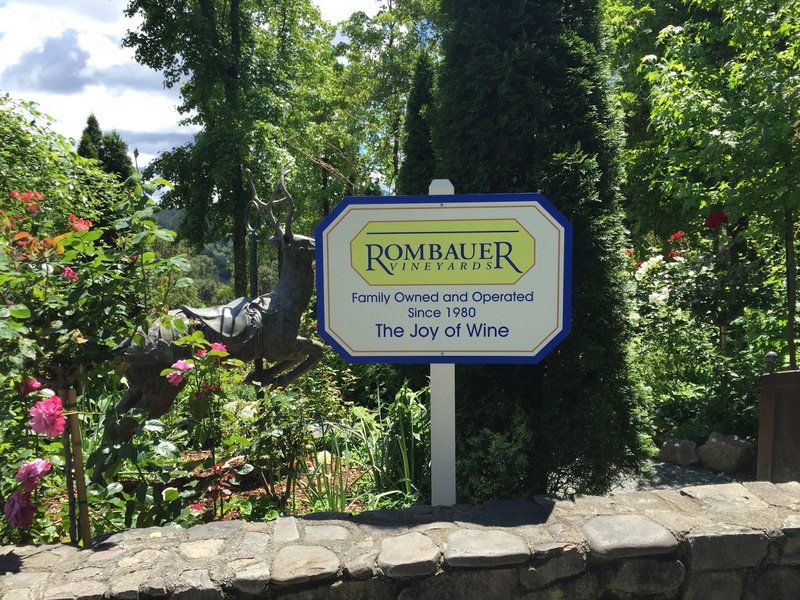 Our next stop was Rombauer- not really what we expected. The grounds were pretty, but unlike all of our other experiences, the employees weren’t very chatty or friendly. Fortunately, another couple was there from this area and were extremely knowledgeable and happy to give millions of suggestions. I did finally make the connection with Irma and Rombauer, who was the author of Joy of Cooking and aunt of Vineyard owner. The wine stewards got much happier when we discussed dogs. Puppy collars were a must! This was the only vineyard shop that had them. We tasted 2014 Caneros Chardonnay, 2012 Carneros Merlot, 2013 Napa Valley Cabernet Sauvignon, 2012 Diamond Selection Cabernet Sauvignon, and a 2013 Napa Valley Zinfandel. From there we went to Franks Family just because everyone seemed to be loving it. The guy pouring was friendly and informative. The wine was nice – but nothing special. We had a Chardonnay, Pinot Noir, Zinfandel and Cabernet Sauvignon (all 2013). We ended our day at Duckhorn, which was a beautiful spot. We sat on a long porch and thoroughly enjoyed the experience. We shared two tastings again so we wouldn’t overdo it! 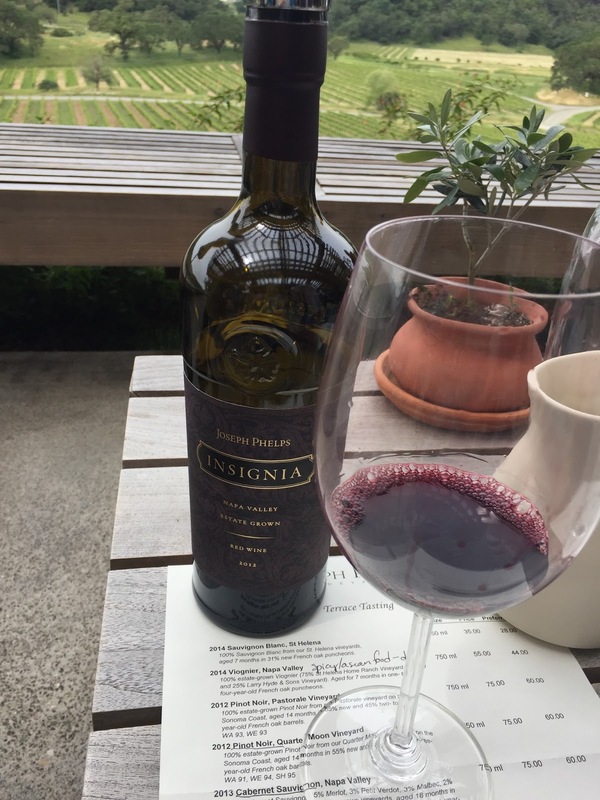 We had the 2013 Napa Sauvignon Blanc, 2012 Merlot, 2012 Napa Cabernet Sauvignon, and the Estate Merlot – Three Palms. Dinner was at the Market right in the middle of town. I would have loved to explore the shops, but everything closes at 4 or 5. We brought our own wine and had no corking fee! We shared the lobster roll – nothing special- and the jalapeno cornbread - not very southern, more bread – but good. Tables all around us were eating fried chicken that looked disappointing. (They need to visit Nashville – but not stay!) I had grilled swordfish. Sammy ordered champagne battered fish and chips. Richard had their bacon and 3 cheese macaroni. We shared the famous butterscotch dessert. Too much food and wine, I went back to our B&B and went to sleep! Roy let me pick a lemon from his huge tree. Brought it back and will plant the seeds. We enjoyed another breakfast at the Spanish Villa Inn and then packed to leave. Based on the advice of the couple we met yesterday, we drove Hwy 128 to Healdsburg; it was a stunningly gorgeous drive – worth the extra 45 minutes! The town was bigger than we thought with a pretty town square. Our tour and tasting wasn’t until 1:30 at Schramsberg so we decided to try Wilson – highly recommended by Sylvia Ganier and the couple we met yesterday. The Wilson family owns several wineries that were recommended to us. Each member of the family has a different specialty. Tasting was an experience. Initially we were the only guests and our server was very entertaining. Wilson is a small vineyard that does mostly Zinfandels. I learned a lot - especially that I actually like the drier ones. We tasted standing at a small bar with a great view outside. The Wilson Family has a great metal sculpture of a moving coyote in front. We sampled a 2012 Chardonnay (loved it), 2012 Ellie’s Petite Sirah – he explained the meaning and history of the word – 2013 Bramble Zinfandel, 2013 Nolan Zinfandel, 2013 Tori Zinfandel, 2013 Forchini Reserve (100 year old grapes) Victoria Johanna Zinfandel, plus a couple of special pours that weren’t on any menu! Loved the picture of the dogs owned by family members (we met Miss Molly later). Wilson - the famous coyote! We grabbed lunch at Oakville and ate in the car as we travelled the road back to Schramsberg. That tour was wonderful. We went through the caves and saw what the production of sparkling wine really entails. Our guide was named Rimple! He loved cooking and shared a favorite recipe that goes well with the reserve – strawberries with ricotta, honey, balsamic, pepper and a bit of tarragon. He had pictures of many former presidents drinking the sparkling wine and a hilarious story about a young Barbara Walters mispronouncing on air Blanc du Blanc as Blankity Blank!! Afterwards, we tried to check into our hotel (again)- Americas Best Value Inn was only moderately awful. We had dinner reservations at Willi’s Seafood and bar. It was a tapas menu and we shared lots of small plates plus a bottle of L Peterson Merlot. We had a spinach salad with dates, almonds and warm bacon dressing, sour dough bread with parsley garlic butter, a lobster roll (low point of meal), a fried fish sandwich, fried clams and shishito peppers and a seared tuna. Too full for dessert. Too tired! Excited about a tour and tasting at Ferrari Carrano at 10:00 (free tour by reservation - very cool!) Breakfast- pastries and coffee at the Flying Goat, and off we went. Our tour guide was so informative – actually the best tour we had. The grounds were beautiful and the story behind the winery was so fascinating. The brass statue of a wild boar sits in the entrance and is kind of a symbol for the winery. We purchased a boar wine pourer/ cork stop. The tour lasted a little over an hour and then we enjoyed a tasting in the upstairs bar. 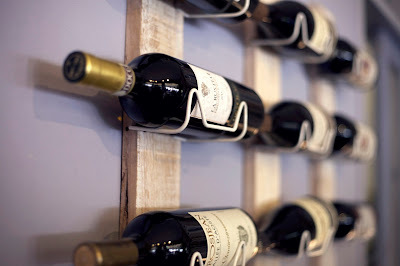 You could pick 5 wines from a menu. I liked the Tre Terre Chardonnay 2013 Russian River Valley and the 2013 Lazy Day Pinot Noir from Anderson Valley. Richard really liked the Lazy Creek Gewürztraminer 2014 (I thought it would be really sweet but it wasn’t – good with spicy food). Finally, what Richard had been waiting for: FRANCIS FORD COPPOLA! The winery is set up on a beautiful hill, but it is so different. People (California people are weird) pay huge amounts to swim in a large, okay looking public pool. We bought an average country club style salad lunch and watched them. It was something! The inside had several movie sets including the chair and table from the Godfather and a car that was in a movie Tucker. They also had all of Francis Ford’s Academy Awards from Patton and both Godfather films on display. They did have tastings, but we just wanted to look at all the stuff. Richard bought a bottle of Director’s Reserve. It was time to finish our tastings with one last fun vineyard and we made a good choice by going to one of the Wilson Family Wineries, deLorimier. It was very small but very pretty. We noticed that tastings in Healdsburg and around were much less expensive and more generous than in the St. Helena area. For $5 each we tasted 5 wines of our choice outside in a small garden. We met Miss Molly from yesterday's painting at Wilson Winery. There was a menu to pick from, and with some help from the staff we chose the 2013 Estate Chardonnay, Malbec Furlong 2012, 2013 Primitivo River Lane, 2013 Harris Kratka Reserve Zinfandel, and the 2013 Two Pear Zinfandel. It was a beautiful setting and we were thoroughly entertained by the bridal party and Pepper, the dog with a mullet. I’m glad we saved Bravas Bar de Tapas for our last night’s dinner. We were seated outside in a courtyard dominated by a huge orange tree and a man making Paella over a large open fire. We shared Pan Tomate and Bacon wrapped dates with blue cheese and Marcona almonds. Next we had croquettes with creamy chicken ham and Gruyere and of course the marvelous Paella. What a production. The rice was browned and the seafood and sausage were perfect. We ended the meal with syrupy delicate rum balls sweet and a little salty and a sherry tasting. It was perfect. Wonderful trip! I’m so glad we came in April for the weather and lack of crowds. I think we all agree it was one of the very best of our trips!! What did you think of Sallie's adventures in wine country? We'd love to hear from you! Haven't read part 1 yet? Make sure to catch up! 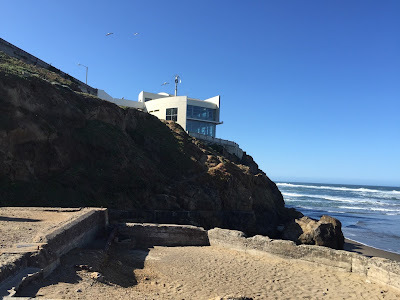 We left early for 10 am brunch reservations at Cliff House and got to explore – VERY WINDY. Brunch was at a beautiful table by the window with views of the rocks jutting out of the ocean. The champagne poured freely! The buffet was a mix of breakfast foods and lots of salads. The popovers were a specialty and the dessert bar was impressive. For Richard and I, an entire bowl of roasted garlic beside the scalloped potatoes was pretty amazing. Another specialty was Eggs Benedict. The harpist was not a specialty and played 2 songs twice in a 30 minute set (As Time Goes By and Somewhere in Time – clearly time was an issue for her). We left to go to the old Beach Chalet (designed 1929 as a hotel) to have a drink and shared some clam chowder (we were too full to eat). Richard got a flight of their home-brewed beers. We then drove back to the hotel past the old windmills. Back in the hotel ,we all had to shower off sand quickly and then went to claim our pre-dinner wine. Dinner was at Fino’s – we were too tired to move. I had Salmon with pesto asparagus and house made rigatoni, Sammy had a pizza and Richard had pasta with Italian sausages. We shared a bottle of wine and a salad of arugula with Gorgonzola and pears. San Francisco was great! We checked out at 9 – a little later than I had planned - to avoid traffic and made a small side trip to the house used for the set of The Room so Richard could have a photo op. Crossed the Golden Gate Bridge (a route we chose for the views) and started the weirdest route to Napa until Richard and I changed phones and we realized his had gone crazy. Started seeing vineyards and finally made a first stop at Domain Carneros for a sparkling wine tasting and cheese pairing. What a gorgeous setting looking across the valley! 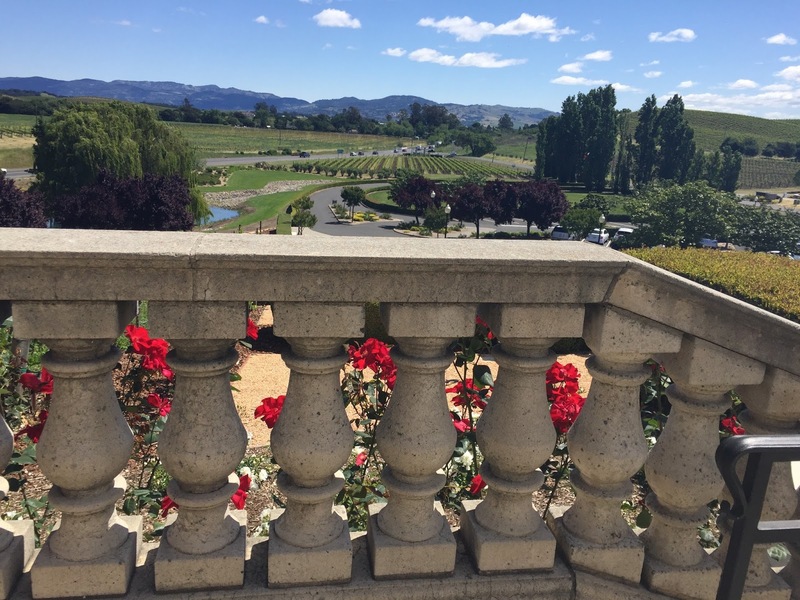 The view took my breath away and the roses…. Sparkling Wine Sampler: 2011 Estate Brut Cuvée, 2012 Blanc de Noir, 2012 Brut Rosé, 2011 Verméil Demi-Sec. 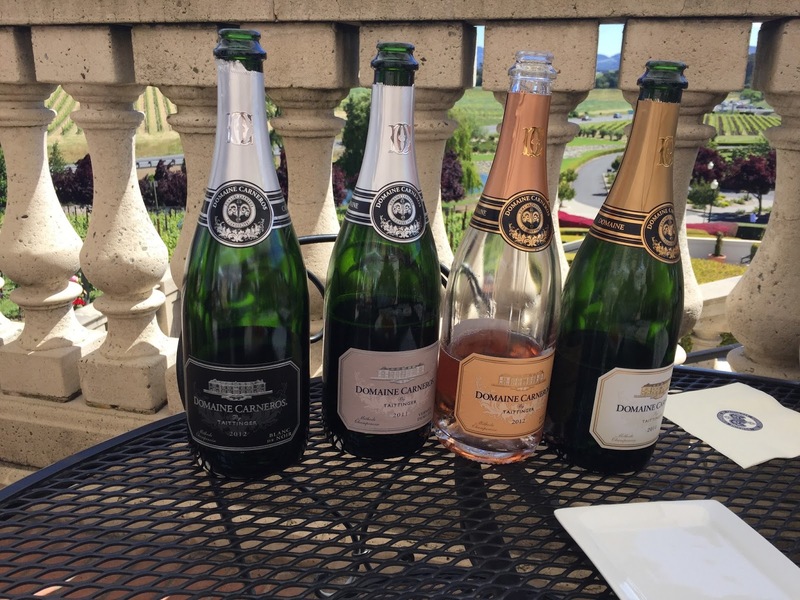 Our wine steward gave us a few extra pours because they weren’t busy – one he called the crème brulee of champagne. The cheeses were: Holey Cow: Central Coast Creamery, Paso Robles, Mt. 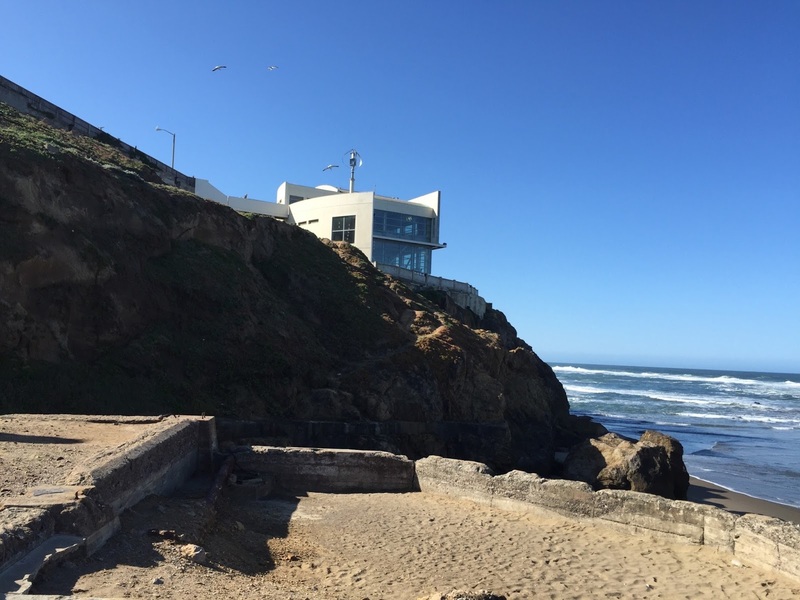 Tam, Tamales Bay, and Essex Street Co. The Netherlands. 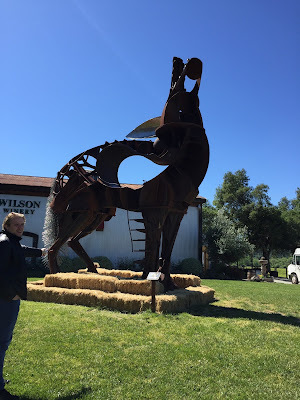 We traveled up the road to Cakebread and barely slid into a tour/tasting with a hilarious guy who kept us thoroughly entertained. 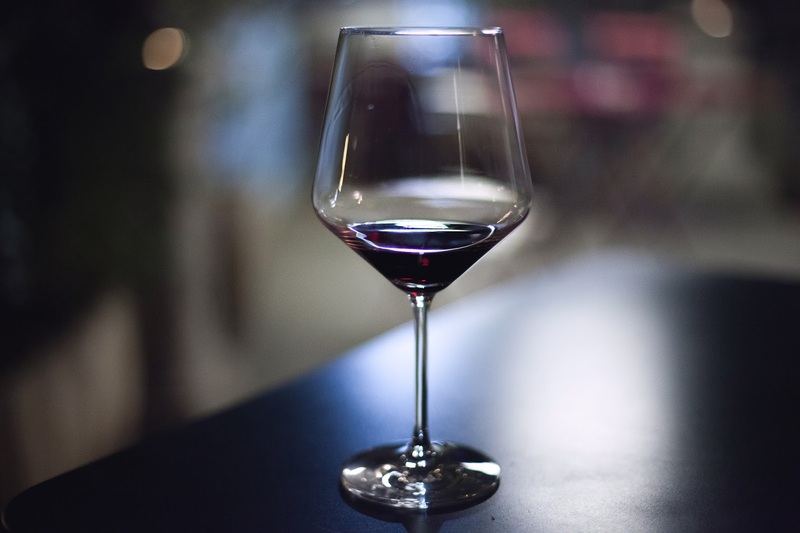 Wines were: 2014 Sauvignon Blanc, 2013 Chardonnay, Napa, Chardonnay Reserve, Caneros, 2013 Pinot Noir Annahala Ranch, 2011 Cabernet Sauvignon, Napa, 2012 Syrah Napa. Our next stop was a quick picnic at Oakville Mkt, which seems to be in the process of a rebuild. Richard and I shared a fried chicken sandwich and ginger ale, which was full of pieces of fresh ginger. 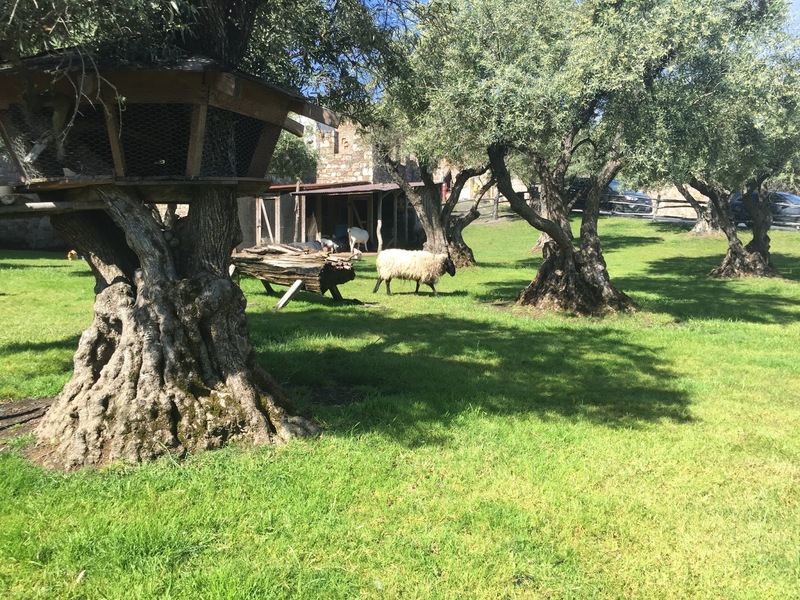 On the recommendation of the nice guy at Cakebread, we went to a charming and tiny boutique winery called Elizabeth Spencer. We sat outside in a little courtyard and the four tastings we signed up for turned into many more. I know we had 2015 Rose of Pinot Noir, Sonoma Coast, 2014 Grenache, Mendocino, 2013 ES Pinot Noir, Sonoma Block 7, 2012 Merlot Knight’s Valley, and 2 different Cabernet Sauvignons (2012) from Napa and one from Mt. Veeder. It was a lovely was to spend the afternoon. It was probably one of my favorite places. They ship so little wine; I’d have to find someone to order it. The name is a husband and wife team. We recommended it to several people we saw again who loved it! From there we traveled to the Spanish Villa Inn, off the beaten track. Our rooms were great – big comfy beds and Roy the proprietor was very friendly – and also spoke 7 languages. No room TVs – kind of relaxing after the noise of San Francisco. We sat outside with drinks and played Bacci Ball. More later! Dinner was at the Farmstead – which is a beautiful working farm. Richard and I shared a grilled artichoke and I had Dungeness crab whole and wood fired in chili lime butter. Perfect. Sammy and Richard couldn’t resist the cheeseburgers. We shared cheddar biscuits with honey butter, which came highly recommended. The waiter brought us a beautiful dessert to share – chocolate cream pie! We were charmed by how comfortable the Spanish Villa Inn was, and how quiet. Roy set gorgeous breakfast tables with china and linen napkins – beautiful silverware. Breakfast was coffee, tea, guava juice, several kinds of bagels and English muffins with butter, cream cheese and jam. There was also fresh cut fruit and brown eggs warm and hard-boiled. He kept asking if we wanted anything else, but it was perfect every morning. Errands first- cold medicine and phone wires. 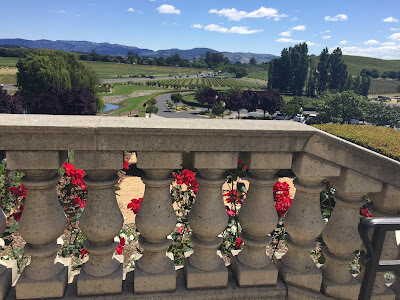 We toured Beringer, but just to see it – no tasting. Also walked around the Culinary Institute. Very nice. We started our tasting day at Joseph Phelps which was just beautiful, maybe our prettiest tasting - definitely the most expensive. We sat on a huge porch overlooking the grounds. We shared 2 tastings. The guide was so informative and just sat with us the whole time chatting. We discussed the ice wines in Canada and he showed us one small portion of a dog bone shaped field that was reserved for ice wine and gave us an extra tasting for all 3 (Like we had in Canada). We also enjoyed tasting the estate's newest olive oil. Wines tasted were 2014 Sauvignon Blanc, St Helena, 2014 Viognier, Napa, 2012 Pinot Noir, Pastrole Vineyard, 2012 Pinot Noir, Quarter Moon Vineyard, 2013 Cabernet Sauvignon, Napa, 2012 Insignia, 2012 Cabernet Sauvignon, Backus Vineyard. That lasted for well over an hour and a half so the next stop was lunch at Gott’s Roadside Stand. It had huge picnic tables to share. We ate with a priest from Nevada and an older lady actually from Napa. She gave us her family winery card from Tedeschi. Of course we had cheeseburgers – what else!!! Wish we had the time to go to Tedeschi in Healdsburg. Our tasting was at Frog Pond, but with a little extra time we went to Round Pond to see the olive oils – as warned – not very friendly – but they did let us taste one. Our guide at Frog’s Leap was very sweet but not terribly well informed. We had a fun group but didn’t learn a thing. Well, I explained what some of the plants were since the guide was unsure of everything but grapes and strawberries. It is a small working farm, with a beautiful barn. Tastings were poured while we walked, 2014 Chardonnay Frog’s Napa, 2014 Zinfandel, Napa, Frog’s Leap Merlot Rutherford, and 2013 Frog’s Leap Estate Grown Cabernet Sauvignon. We came back and visited with Roy before dinner. He “entertained” in a large den and loved to talk and tell great stories. Dinner at Rutherford Grill was at his suggestion. Prime rib sandwiches all the way around. I had the famous mashed potatoes, which were really potatoes with lots of green onion. Hmm. We had a long wait, but no corking fee, so we just enjoyed the wine we brought with us on the porch. Great roasted artichokes! Keep an eye out for part 3 soon! Sallie Swor is a 9th generation Nashvillian and a dear friend who shares my passion for great food and great wine. 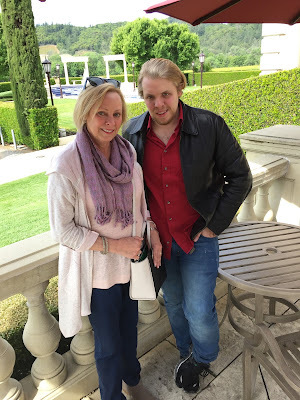 When she sent me her travel journal from her recent visit to wine country, I absolutely could NOT resist asking her if I could publish it on my blog- and she said yes! So this post and the next two will feature snippets from her travel journal- I'd love to hear what you think! Cooking has not only been my obsession and creative outlet, but also my greatest pleasure for as long as I can remember. Way before the food craze, when most of my friends were poring over Cosmopolitan Magazine, I spent my time engrossed in the latest issue of Gourmet. In my first college apartment, I discovered the thrill of entertaining friends with dinner parties, brunches, picnics – well, just any excuse to cook. I also discovered that no one minded! I have been fortunate to have a career working with students and young adults as a high school counselor and college consultant. In writing this cookbook, I’ve been able to use my experience with my students, clients, my own son, and his friends as a way to write in a voice that makes sense to a novice cook while still relating to anyone like me who just loves food and entertaining. The cookbook itself came about as a request from my son as he moved into his first apartment. He was a well-trained food snob and a very independent young man who wanted to provide for himself instead of relying on take out and convenience food, and he wanted to do that without spending a lot of money. When his friends tasted his delicious creations, they all wanted copies of the cookbook. Soon, my friends, many of whom are very accomplished cooks, requested their own copies, so here it is: You’re Grown – Now You Can Cook. 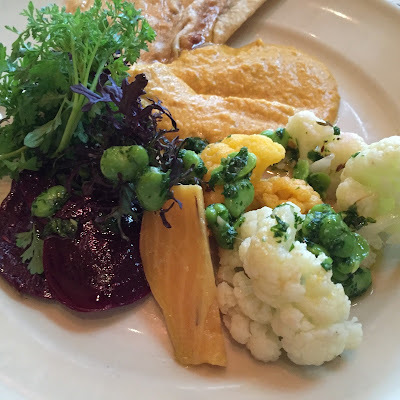 Our flight was delayed by 2 hours, so we missed our Chez Panisse reservations. We were so happy to finally get to The Andrews Hotel a little after 5. Fino – the hotel's attached restaurant, nicely gave us a reservation. We had our "guest" glasses of wine beforehand. Dinner: Three Caesar salads to start. The waiter gave us an appetizer (I guess we looked that pitiful! )- a garlic fry tower with truffle oil and Parmesan. It was fabulous. Had a bottle of the same red wine from the “guest” glass. Too tired to do anything else. Got up early to go to the Saturday Market at Pier 1. Beautiful produce, and local products were available at every stall. (It had really grown when we left) We walked all the way down to Pier 39 to see the sea lions. Fabulous. It was a perfect walk – all the piers are different. Fun restaurants and shops were all along the way. Stopped in a middle pier for Richard to get an Alcatraz shirt. Chez Pannise also felt sorry for us yesterday, and gave us a Saturday reservation. It was hard to find, but worth it. The charming shopping area in Berkeley was a pleasure to stroll around in. We were actually early, and were seated anyway. Me: Roasted beets and cauliflower with fava beans and chick pea puree, Fire roasted clams, shrimp, and scallops with adorable tiny potatoes and a garlicky sauce. Richard: Garden lettuces with baked Andante goat cheese. Pizza with wild nettles, artichokes and salata ricotta. He got even with those nettles from long ago. The waitress loved our accents and gave us a plate of olives for the table and lots of delicious bread. For dessert: Almond tart with Chantilly cream and strawberries to share! It was miraculous! I bought Alice Water’s (executive chef, founder and owner) latest cookbook- My Pantry – it was autographed by Alice. Dinner reservations were at M.Y. China. It’s in a fabulous setting – 1½ million pound dome above us in a shopping mall. We got a table with a view! Also cool lights that were motion capture screens to dance with while we waited. It was amazing. We shared seafood and pork dumplings, scissor cut noodles with beef instead of wild boar (best thing ever!! ), walnut glazed shrimp, General Mao’s Chicken (too hot). Came home with chopsticks! Keep an eye out for part 2 of Sallie's California adventures! Don't put me in your box, don't assume that because I'm a 24 year old Kenyan woman of Indian origin, I must fit a certain stereotype. I'm ambitious, and I want a lot more out of my life than you think I'm aspiring to. No, I don't need to 'think about settling down' because 'women should start planning their family around the age of 28'. Marriage, a family, all that- they're not unimportant, but they're not all that a woman can have. Don't measure my success by where you/your daughter/your neighbour's daughter were/are at 24. That's their story. And I'm writing my own. When you look at me, then find out what I studied/where I studied/where I've worked and say something like "Wow, I had no idea you were smart! ", don't expect me to take that as a compliment. If you're willing to judge someone at face value, then I'm more than entitled to judge you for the person you just showed yourself to be. When you find out that I'm planning to undertake a workout programme and you say something like "Be careful or you'll get muscles! ", don't be surprised when I look confused. If you learn about my accomplishments and say something along the lines of "Wow, that's so awesome for a woman/girl! ", be prepared for me to look at you like you just sprouted another head. Does being a woman exclude me from aspiring to success? Does being a woman mean that I'm automatically less intelligent than everyone else you know? I remember being asked at a job interview "You have a really impressive background, but wouldn't you rather just work in the beauty industry? You know, being a woman and all?" I won't apologise for not laughing at your racist, homophobic, and/or sexist jokes- no matter how uncomfortable that makes you. No, it's not funny when you say that someone is 'not a man' because they chose to stay home with their children instead of going out with you. 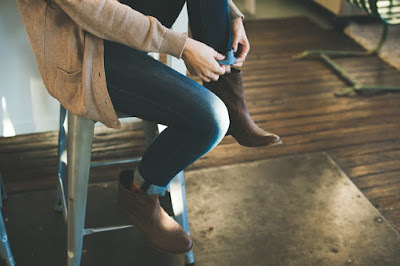 If you're the most loving, kind and supportive spouse, and you both have an awesome relationship, but when you're out with your friends you make jokes about how women 'nag all the time' or how 'men never get anything done'- that's not funny either. It's not funny when you think that just because your skin colour happens to be lighter or darker than someone else's, that gives you automatic superiority- it doesn't. You know what makes someone 'better' or 'worse' than someone else? Who they are. NOT the colour of their skin. If you laugh at people for being 'stupid and closed minded' but the last time you bothered to learn something new was when you were in formal education, and you dogmatically reject all that is unfamiliar to you... yes, I probably will say something. Nobody's perfect- but I think that those with the ability to make change happen almost have a responsibility to do so. 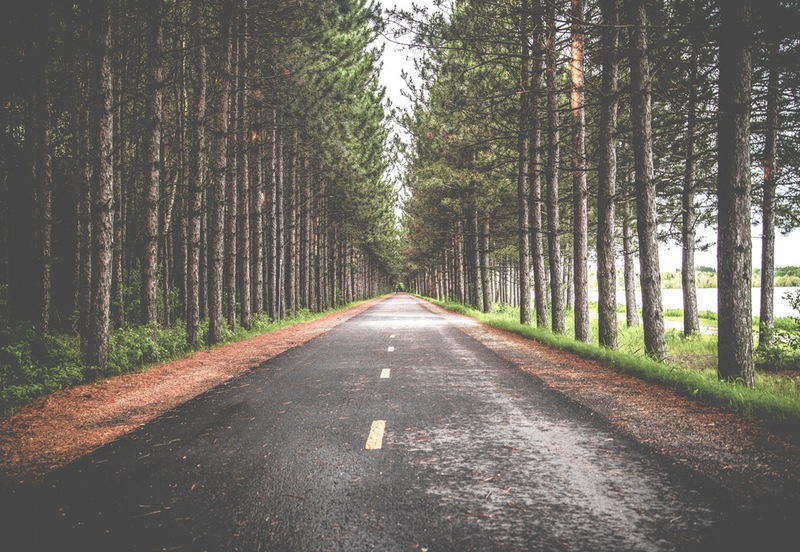 If we don't grow, if we never improve- how meaningful are our lives really? This is my life, and my story, and I want you to realise we can be different without being at conflict. 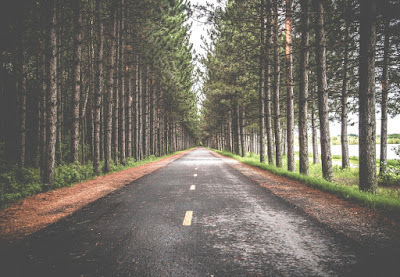 Don't put me in your box- allow me to forge my own path. I'll make mistakes, I'll fail, I'll do stupid things more than once in a while. But I'll learn. And I'll grow. Liked this post? Don't forget to comment/share on Facebook, and like/RT on Twitter! 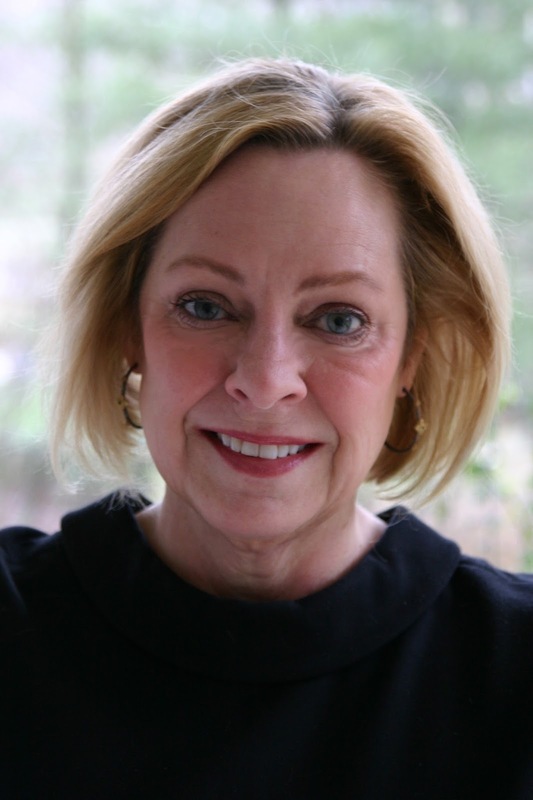 Mother's Day (the American one-and graduation for Sewanee C'16!!) is coming up this Sunday. 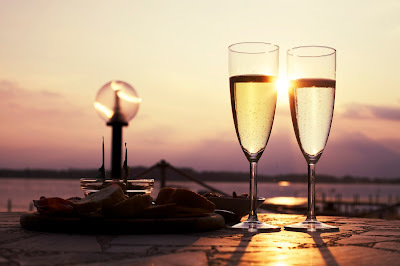 While we definitely should celebrate the loved ones in our lives more than just once a year, I do like occasions like these because they just give us another excuse to pamper those we love. 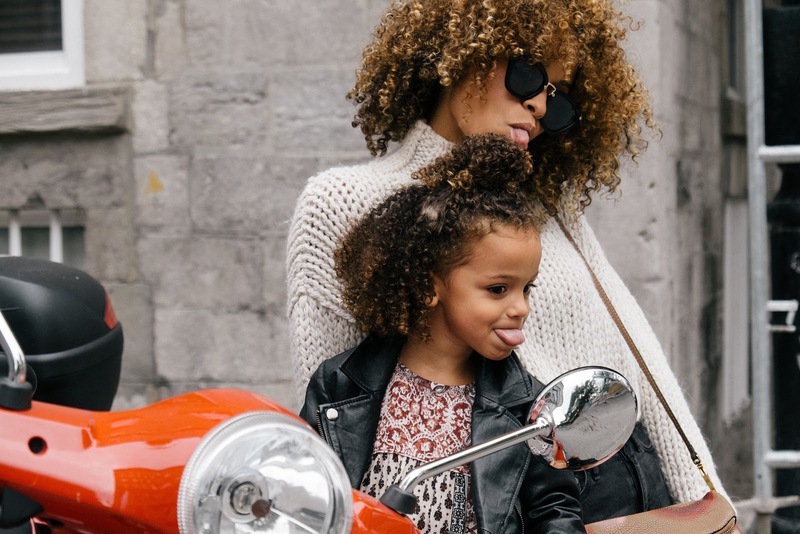 Here are some gift ideas for the special mums in your life! Any ideas you have? I'd love to hear about them! 1) A day off: Mothers are known for being perpetually busy- I know my own is fully capable of conjuring up a busy day (there's so much to be done!) when she really should be relaxing! Here's a day when you can tell your mother (or a mother in your life, really) to just take things easy. It's a Sunday, so she should (hopefully) be off work. Bring her breakfast in bed, schedule a massage/spa session for her, take her for a hike- basically, plan anything that wouldn't require much effort on her end! She's certainly deserved it. 2) A video celebrating her: Here's a fun way to celebrate the special mums in your life- get together people who know her well, including her children, and make a video telling her why you think she's such an awesome mum and what you love about her! She's bound to love it, and will treasure it for years to come. 3) A time capsule: This one might require a little advance preparation, but it'd be a fun gift to open! Collect snippets and mementos of her time as a mother- pictures of her babies' milestones, drawings her children have done for her- anything really! Even a rock from a hike she enjoyed with her kids counts. Add notes from her children (if they're too young, scribbles/handprints work too), and get as creative with the packaging as you'd like. When she is gifted the time capsule, you get to tell her how many years later she gets to open it. 4) Memories: What better way to preserve memories of motherhood than by giving her pictures she can see AND touch? Have you ever met a mother who ISN'T happy to look at pictures of her children? Using an online service (like PerfectPics in Kenya) to create photobooks, fridge magnets, picture mugs, canvases and other such products is fast and easy, and is definitely worth it! 5) Food: It's a rare person who doesn't like food- and I'm willing to bet that the mum you're celebrating isn't one of them! Whether you put together a picnic basket, and set off to a place like Karura Forest, or have her kids cook her something special, or take her to a nice restaurant (if you're in Nairobi, Zen Garden, About Thyme or 360 Degrees Pizza are just a few of the ones I'd recommend), she's sure to love it! 6) Adopt a pet: Mother's hearts are notoriously large, and this love doesn't just stop at her human children! KSPCA Kenya have a long list of cats and dogs that are looking for their forever homes. Important: Only gift a gift like this if you know that the household will be able to care for and love the pet for the duration of its lifetime. Pets are not a responsibility to be taken lightly- indeed, they are part of the family. 7) Give her a foster elephant: Conversely, if she is an animal lover, but isn't able to physically care for a pet at the moment because of space/time/other constraints, why not consider fostering an elephant for her? The David Sheldrick Wildlife Trust does a lot of great work with orphaned elephants- and has lots that you can choose to foster! 8) A monetary gift: And no, before you ask, I'm not talking about giving her money. Parenthood definitely not cheap, and so, depending on who the gift is from, a contribution toward something for the kids would definitely be appreciated! This is an especially useful gift when it's coming from extended family and friends to a mother of young children. Maybe offer to pay for an after school activity for a year? Or set up an account that family and friends can deposit money into that'll go toward education expenses when the kids are older? Perhaps it doesn't have to be monetary in the literal sense- offering to babysit two or three times a month so that she can have some much needed me time works too! Liked this post? Don't forget to comment (and turn on notifications so that you know when I reply), like and share on Facebook, or retweet on Twitter!